We’re thrilled to announce that our two-day Active Directory and IT security seminar will be available for online attendees. If you’ve always wanted to attend one of our seminars but haven’t been able to make the trip, here’s your chance. 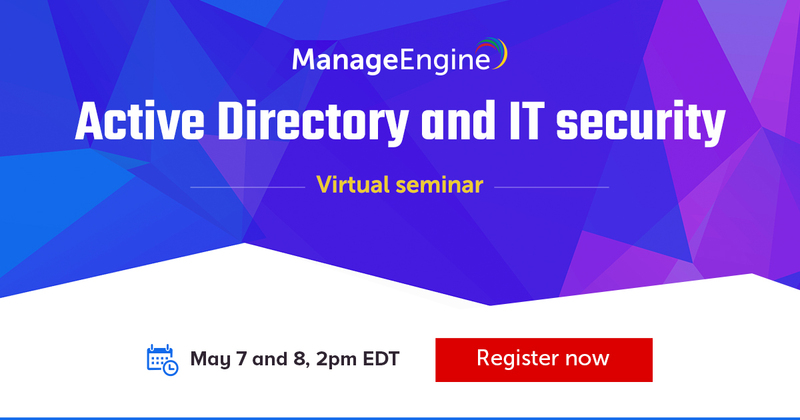 Join us online on May 7 and 8 as our technical evangelists help you get up to speed with all the latest trends and best practices in AD, IT security, and much more. You will also learn how adopting an SIEM solution can help prevent data breaches in your organization. Our experts will also present detailed use cases that show how our solutions can help you meet all your IT requirements. The sessions are carefully crafted from feedback received at previous seminars and are tailored to benefit IT professionals across the globe. If you have any questions, feel free to send us an email, and we’ll be happy to answer them.